The Construction Industry Federation Conference in Croke Park took place on 29 September 2018 and featured interesting presentations and panel discussions relating to the construction industry. The day included a presentation on the growing movement towards taking account of social considerations and responsibilities in Public Procurement. Sandi Rhys Jones OBE spoke about the “social return on investment” and highlighted that Westminster Town Council has introduced a social inclusion element of 5% to 10% in addition to technical price in their procurement processes. Socially Responsible Public Procurement (“SRPP”) is about setting an example and influencing the market-place. By promoting SRPP, public authorities can give companies real incentives to developing socially responsible management. By purchasing wisely, public authorities can promote employment opportunities, social inclusion and accessibility, ethical trade and seek to achieve wider compliance with social policies and objectives. 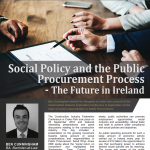 As public spending accounts for such a large amount of economic activity carried out in Ireland every year (in excess of €12 billion) the opportunities to use that purchasing power to achieve desired social policies are far reaching. The scope and power of the public procurement process to affect social change is enormous. SRPP can contribute to enhancing compliance with national or international commitments to social development goals. There is a growing concern in many countries that traditional ways for achieving social cohesion are not adequate. SRPP can help accelerate social objectives such as increasing regional and local economic activity, assisting compliance with social and labour law, including related national and international policy commitments, stimulating socially conscious markets, demonstrating socially responsive governance, stimulating integration and ensuring more effective public expenditure. One of the objectives of SRPP is to further the EU’s objectives of sustainable economic growth and improving living and working conditions. The EU Procurement Directives, adopted on 31 March 2004, consolidated the legal framework. They mention ways of incorporating social considerations into technical specifications, selection criteria, award criteria and contract performance clauses. This can have a disproportionate effect on SMEs – particularly for contractors and for sub-contractors who can assume the financial burden indirectly. These direct and indirect costs should be taken into account by public authorities when deciding how or whether to incorporate social considerations into procurement operations. The key principles of fairness, non-discrimination and transparency remain fundamental to EU procurement rules. SRPP stands to become an increasingly more important part of the process. comply with certain conditions when carrying out the contract once it has been awarded. These criteria can be used alone or combined with one another, depending on the desired outcome. In Ireland, the Public Services and Procurement (Social Value) Bill 2017, which is designed to increase competition in the public procurement tendering process by enhancing Small and Medium Sized Businesses’ ability to compete for public procurement tenders, is making its way through the Oireachtas. This Bill is widely welcomed as a step in the right direction. The Bill aims to allow public bodies to have regard to economic, social and environmental well-being in connection with public services contracts. Challenges in the use of social clauses in public procurement arise from the need to ensure the clauses are not discriminatory, that value for money is not adversely affected, additional costs are not placed on domestic or smaller suppliers relative to other potential suppliers, that social clauses are linked with the subject matter of the contract and the targeted benefit is capable of being measured and monitored during the execution of the contract. As the country moves forward, a wide range of social and environmental policies can be achieved while also maintaining economic growth by using social clauses and other methods to achieve desired social policy outcomes within the public procurement process. Businesses will need to change and embrace change to be competitive in the future. Quigg Golden, with its expertise in the procurement process and contract drafting, is ideally placed to provide practical advice in a changing procurement market.